Rajasthan : Chittorgarh to Bundi | Horn please, OK? 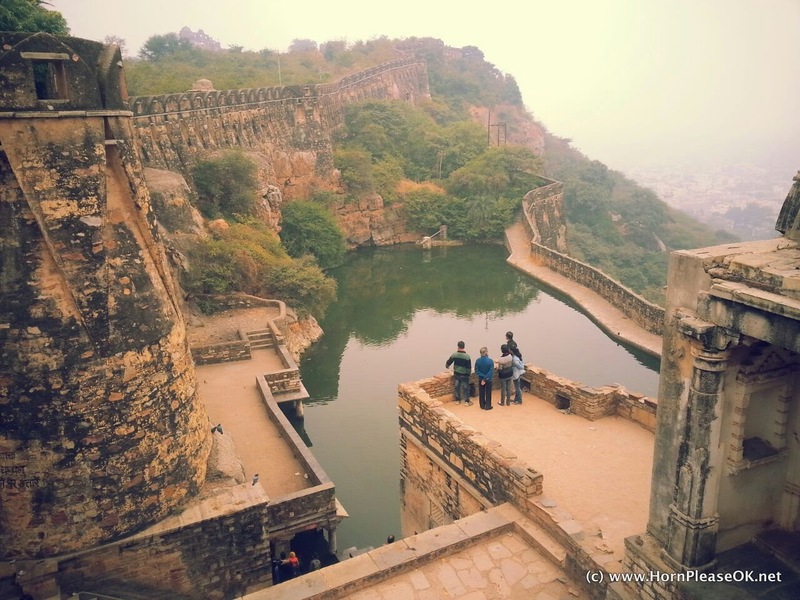 Chittorgarh was to Rajasthan what King's Landing is to Westeros, minus the good weather. Its the star of Rajasthan's historical monuments and today we were going to find out why. 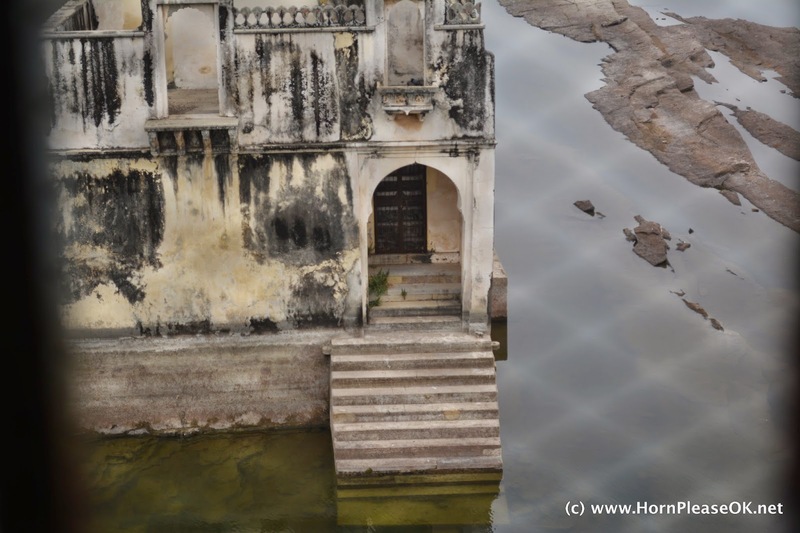 A bit of bad planning had us booked at Lake Nahargarh Palace the previous night. Its a bad ripoff of the Lake Palace at Udaipur. The rooms were tacky and the corridors smelt of pee. It didn't help that there was a large party of men who had descended from Kota to celebrate something. We couldn't get away fast enough. The hotel while in Chittorgarh district is at least 50 kms away from Chittorgarh Fort. So if you're looking for a place near the fort, this is not it. Travel tip: Don't get misled by the pictures on Tripadvisor or the hotel's own website. You're better off paying a fraction of the room tariff and staying at a 2 star hotel in Chittorgarh town. NH 76 is a well maintained, divided 4 lane highway and it leads straight to Chittorgarh fort. The highway has a nice broad shoulder, great for stretching your legs and taking in the rustic views around. Fog still lingered in the air. It wasn't as thick as the previous night instead it gave everything a blurry outline. We reached our destination well before Chittorgar's daily market had a chance to spread itself out. The road leading up to the entrance looks like an obstacle course at any other time of day. Chittor or present day Chittorgarh was the capital of the state of Mewar from the 7th century to the 16th century. The fort at Chittorgarh, a UNESCO World Heritage Site, is one of the most awe inspiring forts in Rajasthan and is revered almost like a site of pilgrimage by present day Rajputs. Chittorgarh fort, the largest in India by area, is built on a hill spread over 700 acres. It is entered by driving through a 1 km long steep road marked by 7 gates (called Pols). Half way up the road we noticed that we had a retinue of leather jacketed bikers. A few of them were trying to get our attention so we rolled down our windows to find out what they wanted. They were 'local guides' trying to sell us their services! And boy were they aggressive. There wasn't much room to shake them off so we continued the rest of the way with a growing wake of bikers. Travel Tip: Always pick a government registered tourist guide. They're better informed and have a standard fee. Ask to see their registration papers. At the ticket booth we were all but accosted by touts and guides yelling over each other to be heard. We ignored them and found ourselves a government approved guide, a woman who knew what she was talking about. Within the fort walls lie 65 structures, an assortment of palaces, temples and memorials interspersed with 22 water bodies. For history lovers its like being a kid in a candy store. Its possible to spend days exploring the fort grounds but with half a day at our disposal, our guide helped us pick the important spots and we set off. Travel Tip: The fort is best seen by driving through the ruins. If you don't have your own vehicle you can rent an auto rickshaw or a six seater at the fort. Kumbha Palace named after Rana Kumbha (of Kumbhalgarh Fort fame) is more than a 1000 years old and the oldest of the still standing structures within the fort. It was home to some of Indian history's most famous figures - Udai Singh II who founded Udaipur , Rani Padmini and Mirabai. Mirabai was said to be Lord Krishna's greatest devotee and is famous for the poems or 'bhajans' she wrote in praise of him. There's a mystery surrounding her death. She is believed to have disappeared into an idol of Lord Krishna at the temple in Dwarka while praying to him. She started off life as a Rajput princess born in to the Rathore clan. Her great grand father was Rao Jodha, the founder of Jodhpur and she was married to Bhoj Raj the ruler of Chittor in the early 1520s. As a queen of Chittor, she lived within the fort in a palace built within Kumbha Palace. Betrayals and the threat of attack were common features of royal life. Hidden chambers and secret passages were safeguards against these and Kumbha Palace had its fair share of them. Our guide pointed out a trapdoor that opened in to an underground passage used by Rani Padmini to go to the Goumukh Kund when Chittorgarh was attacked by Allaudin Khilji. Udai Singh II, the founder of Udaipur was born in Chittorgarh. The fort was attacked when he was a baby. His nurse Panna Dai saved his life by sacrificing her own son claiming that he was the baby prince. Udai Singh was whisked away in a basket to Kumbhalgarh where he spent his childhood. Across the road from Kumbha Palace stands the Naulakha Bhandaar. The Bhandaar or treasury was said to always contain at least 9 lakh rupees which is how it got its name. 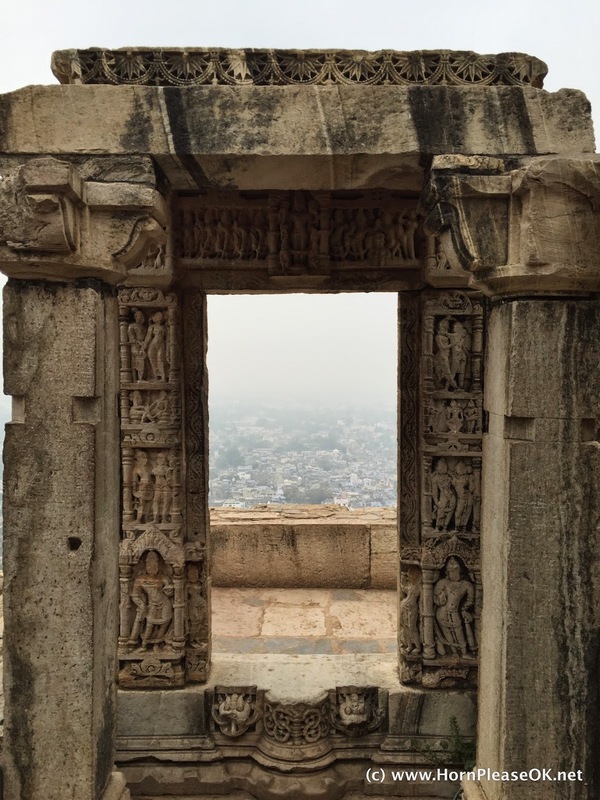 Chittorgarh has a number of Jain monuments owing to Jain merchants who lived in the fort. This Jain temple was sacked and destroyed by the Mughals in the 16th century. A trademark of theirs was to deface the sculptures and tear down the roofs. The roof was later replaced by a dome, a signature element of Mughal architecture. The syncretic Kalika Mata Temple in Chittorgarh fort was originally built for the Sun God in 8AD. Sometime in the 14th century it was converted to a temple for Kali. 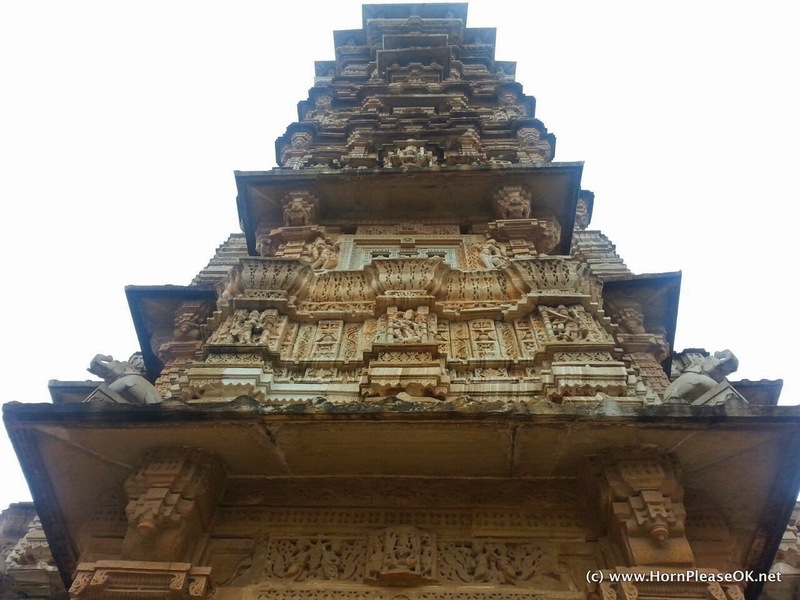 More recently, descendants of Chittorgarh's erstwhile rulers have placed an idol of Radha Krishna inside. Like much else even faith is mutable. 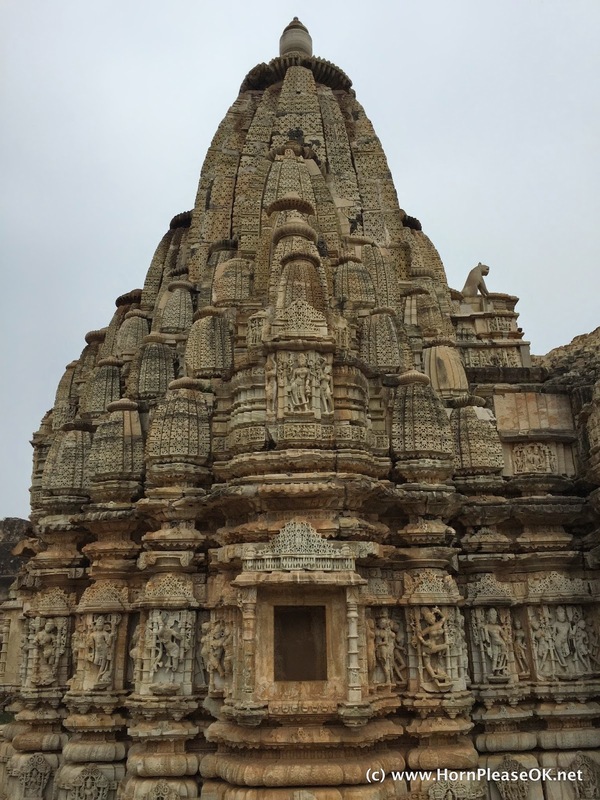 The Kirti Stambh in Chittorgarh was built in the 12th century by a Jain devotee to honor Adinath, the first Jain Tirthankara (savior of sorts). It's 52 stories high and has started leaning slighty like the Tower of Pisa. Visitors aren't allowed to climb to the top but the view from below of its marvelously sculpted balconies and ledges are all you really need to see. Padmini was the wife of Rana Ratan Singh, one of the rulers of Chittorgarh. She was known for her beauty and wit. Allauddin Khilji who had his eye on Chittorgarh demanded that he be allowed to meet her and in return would spare the kingdom. They arrived at a compromise where Allauddin Khilji was allowed to see Padmini's reflection in the water from a tower nearby. 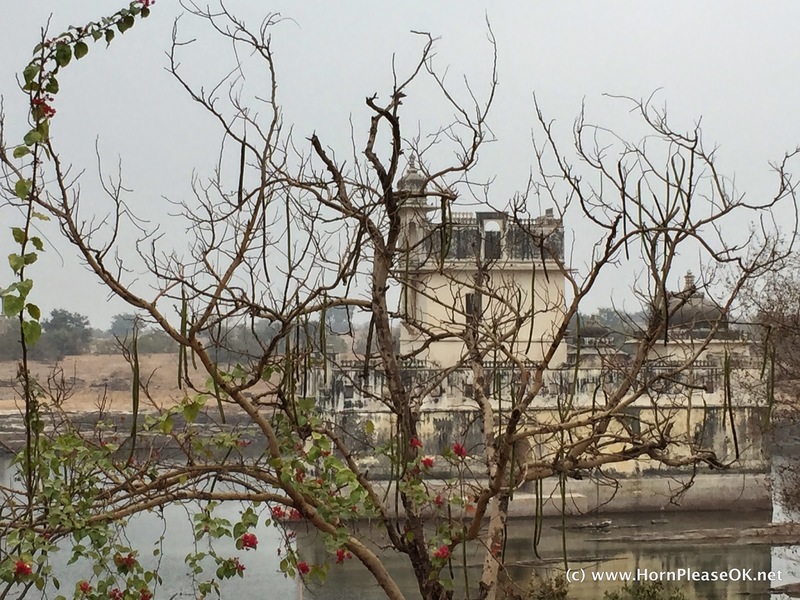 Padmini's Palace was built in the middle of the lake supposedly in 10 days, to fulfill this compromise. Allauddin Khilji, not a man of his word, betrayed Ratan Singh's trust and captured him on his way out of the fort. Rani Padmini, a strategist, offered herself up to Allaudin Khilji in return for her husband's freedom. But she had a condition. She would be accompanied by 700 of her handmaidens to his camp. Allauddin Khilji acceded to this request. Rani Padmini and her 700 handmaidens who were actually soldiers in disguise entered Khilji's camp and wrought havoc and destruction. Ratan Singh was killed in the tussle and Rani Padmini committed jauhar (a sacrificial act of jumping into a burning pyre) to protect her honour. The Samadhishvara temple goes back all the way to the 11th century. 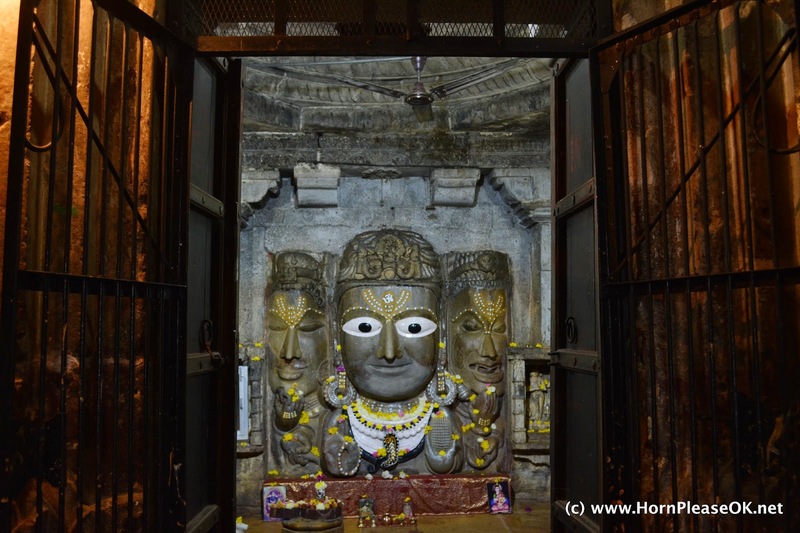 It was restored 300 years later by Mokal and holds the strangest looking idol of the trinity of Brahma Vishnu and Mahesh. This 1000 year old idol inside the Samadishvara temple made us think of the Easter Island statues. Unlike any Hindu idols we've seen, it made us wonder what was underneath the painted eyes. 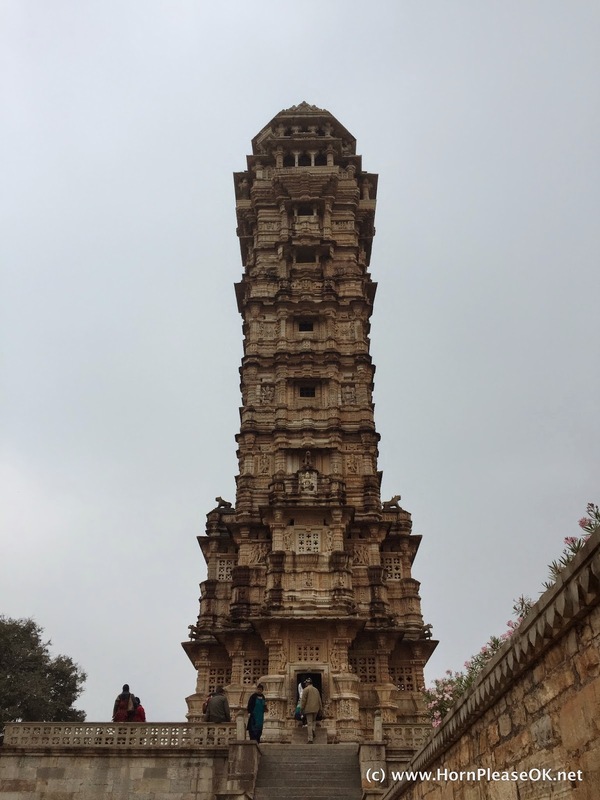 The Vijay Stambh has come to symbolise the valour, bravery, and spirit of Chittorgarh. It was built in the mid 15th century by Rana Kumbha to commemorate the victory of Mewar in a battle against Mahmud Shah and the armies of Gujarat and Malwa. 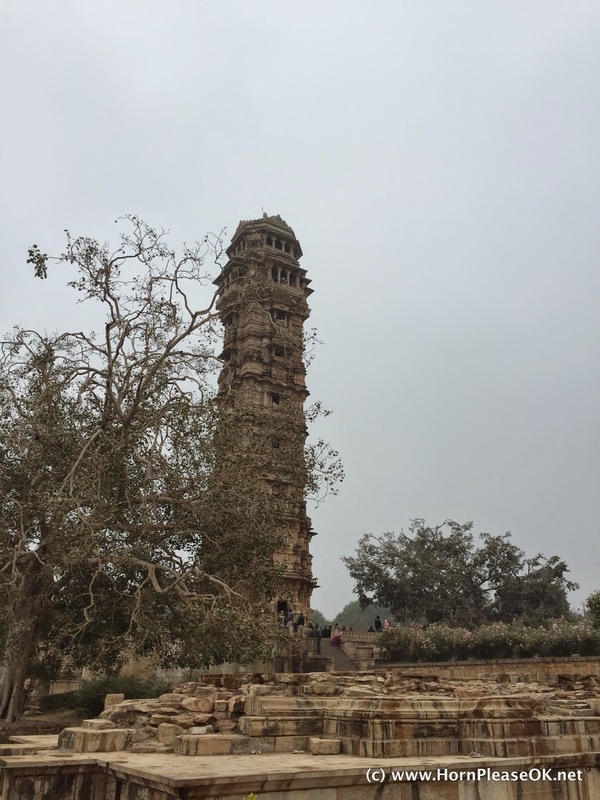 Unlike the Kirti Stambh, this 37m tall tower still allows entry to the curious. As a mark of respect visitors are asked to take their shoes off before entering the monument. The cold was a huge deterrent and we satisfied our curiosity by walking around the tower admiring its intricate carvings and inscriptions. Adjacent to the Vijay Stambh is a massive flat platform like structure said to be the site of one of 3 jauhars that took place in Chittorgarh. Every year, the town celebrates the bravery of those Rajput women who sacrificed their lives to protect their honour by organising a mela. Chittorgarh is fascinating even for those uninspired by history. Our drive through the fort felt like a class 8 history lesson, in technicolor. Maybe it was our guide's storytelling skills or maybe its that every rock in the fort has played a part in shaping the story of India. Bundi was the last stop on our 8 day road trip across Rajasthan. Its relative obscurity keeps away the tourist hordes. NH 76 from Chittorgarh to Beejoliya was a smooth drive. We missed the turning to Bundi and stopped at a teashop to ask for directions. They pointed us to a potholed road (SH 29) leading off the highway. We've driven down village roads near neglected border areas that are in a better condition. Travel Tip: Avoid SH 29. It may seem shorter but its not. Take the route that goes via Kota. Your back and your car will thank you for it. The road got so bad at one point that we contemplated turning back. Backtracking down the same road was going to be too painful so we put on our brave faces, gritted our teeth and forged on. The road joined NH12 10 kms from the exit to Bundi. And then we saw this. Any misgivings we had flew out of the window. Thank you for the wonderful post. I came here looking for the best route to Bundi from Chittorgarh. Thanks for the tip to take Chittorgarh - Kota - Bundi instead of SH29. I hope Kota - Bundi is in reasonable condition. We're so happy that you found useful information on our blog! Did you take the Kota-Bundi route and what was the condition of the road?